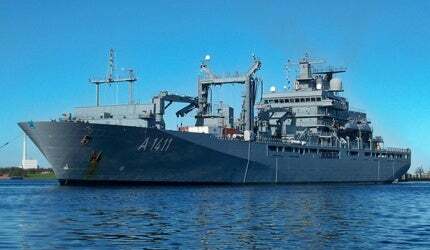 The Type 702 Berlin Class fleet auxiliary vessels are the largest vessels of the German Navy. Image courtesy of Ein Dahmer. Aft side view of the fleet auxiliary vessel Berlin (A 1411). Image courtesy of Ein Dahmer. A close view of the MLG 27mm auto-cannon on the Berlin (A 1411). The German Navy naval auxiliary, FGS Frankfurt am Main (A 1412) departs Portsmouth Naval Base. Image courtesy of George.Hutchinson. Mexican Military Commandos rappel onto the German Navy combat support ship Frankfurt am Main (AM 1412) during a boarding training exercise. The Type 702 Berlin Class fleet auxiliary vessels are in service with the Deutsche Marine (German Navy). The auxiliary replenishment ships are designed to provide logistics and medical services support to the combined task forces. The vessels are named after German cities. The lead ship in class, Berlin (A 1411) was launched in April 1999 and commissioned in April 2001. The Frankfurt am Main (A 1412) was commissioned by the German Navy in May 2002. The keel for the third unit was laid down in September 2010. The ship was christened Bonn (1413) in April 2012. Bonn is expected to be delivered by the end of September 2012. Berlin Class vessels are the largest warships in the German Navy fleet. Berlin (A 1411) was recently deployed in operation Atlanta in the Horn of Africa. "Berlin Class vessels are the largest warships in the German Navy fleet." The first two units were built by FlensburgerSchiffbauGesellschaft. The third ship is being built by a consortium of four dockyards including Fr. LürssenWerft, FlensburgerSchiffbauGesellschaft, ThyssenKrupp Marine Systems and Peene-Werft. The hull of Bonn was built by Peene-Werft in Wolgast, while deckhouse was constructed by FlensburgerSchiffbauGesellschaft in Flensburg. The ship is outfitted by EmderWerft und Dockbetriebe (EWD), a subsidiary of ThyssenKrupp Marine Systems. Blohm + Voss Naval, a sister company of EWD delivers engineering services and system support. The Sachsen Class (F124) is Germany’s air defence frigate built by ARGE F124, a consortium consisting of Blohm + Voss as the leading yard, Howaldtwerke-Deutsche Werft and Thyssen Nordseewerke. The latest ship features improved functional areas than the earlier units. It was designed to overcome current operational limitations in the area of environmental protection safety. The new design is intended to reduce operation and maintenance costs for the German Navy in future. The new ship incorporates significant improvements and additions including an integrated bridge and a double hull in accordance with MARPOL. The vessel is also equipped with a new air-conditioning technology, additional air-surveillance radar, new engines and advanced helicopter controls. It also incorporates a new crewing concept. The Berlin Class has an overall length of 173.7m, beam of 24m and a draft of 7.4m. The displacement of the ship is 20,000t. The vessel can accommodate 237 personnel including the ship and helicopter crew, and patients. A single Berlin-class can transport 9,600 cubic meters of fuel, 550 cubic meters of water, 160t of ammunition, 280t of food, 100t of dry stores and 32 containers. The Berlin Class is fitted with replenishment-at-sea (RAS) systems, complying with the Nato regulations. The ship can accomodate two helicopters and is equipped with in-flight refuelling-capabilities (HIFR). The loading and offloading of cargo is carried out by two 24t cranes. The large modular hospital (MERZ) has 45 beds for general patients and four for intensive care (including hospital ward). It also includes a clinical and microbiological laboratory, sterilisers and workshops. The Berlin Class is armed with Stinger surface to air missile and four MLG 27mm auto-cannons. The Stinger is a man-portable air-defence system (MANPADS). It has an effective range of 4.8km. "The Berlin Class ships have a flight deck to support the operations of two helicopters." The Berlin Class ships have a flight deck to support the operations of two helicopters. The flight deck can accommodate two Sea King or MH90 helicopters. The hangar facility is available for embarked helicopters. The Berlin Class replenishment oilers are powered by two MAN Diesel 12V 32/40 diesel engines. Each engine, rated at 7.2MW, drives a four bladed controllable pitch propeller through a reduction gear. The ship is also equipped with a bow thruster for high manoeuvrability. Auxiliary power is provided by four 1,200kW diesel generators. The propulsion system provides a maximum speed of 20kt. Berlin Class vessels have an endurance of 45 days.